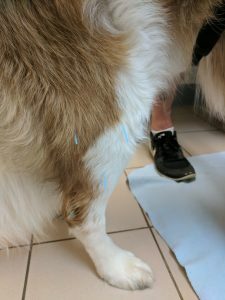 Abstract: A 5 year old female spayed St. Bernard presented with a 2 month history of lameness on her left hind leg that had become acutely worse. A suspected cranial cruciate ligament injury was diagnosed. Surgical intervention was declined. Her treatment plan involved pain medications, acupuncture and strengthening exercises. Response to these treatments was excellent and she is expected to make a full recovery. History and Presentation: A 5 year old, female spayed, 50kg, St Bernard named Peanut presented to the clinic for evaluation of lameness on her left hind leg. The lameness had started 2 months ago and she was examined by another veterinary clinic at that time and had radiographs performed. Those radiographs showed marked effusion of the left stifle and very early osteophyte formation. She was placed on Meloxicam and surgical intervention was discussed. Meloxicam and exercise restriction were continued on and off for approximately 2 months until she presented to my clinic for acutely worsening lameness. There was no prior surgeries or ongoing illnesses. She was usually a very active dog. Peanut is a very nervous dog in the clinic and therefore a thorough physical examination has always been a challenge. On initial presentation, she showed moderate to severe lameness on her left hind leg. She was toe touching most of the time and was never fully bearing weight on this leg. Her left stifle was moderately thickened, especially on the medial aspect, and warm compared to the right stifle. She was very tender on palpation of the entire left stifle region and extremely tense on this entire leg making myofascial exam difficult. There were no neurological deficits detected. Patellar reflexes were normal. The rest of her physical exam was unremarkable and she was in excellent body condition. She was rechecked after one week of non-steroidal anti-inflammatories and gabapentin and was much less sore at this time. Girth measurements were taken of both legs and the left leg was quite a bit smaller than the right hind leg. She was still quite lame but bearing more weight than the previous week. Thorough discussion of surgical vs. medical management were reviewed with owner. The owner was not wanting to pursue surgery. We then discussed that our focus would be to treat pain and inflammation, strengthen muscles and joints where needed and maintain a healthy weight. The owner knew I was studying acupuncture and was willing to let me add this into the medical treatment plan. We started treatments one week after initial presentation since she was so painful on initial exam. Differential Diagnoses: Cranial cruciate ligament tear was the primary differential diagnosis based on signalment, history and radiographic findings. Osteosarcoma or synovial cell sarcoma could not be completely ruled out. Penetrating foreign body to the left stifle was also considered however the chronic, progressing nature of the lameness made this less likely. Definitive (or Putative) Diagnosis (or Diagnoses): Based on evidence of stifle effusion on radiographs, the history of progressing lameness and her quick response to anti-inflammatories and pain relief, I suspected a partial cranial cruciate ligament tear that had progressed. To confirm this diagnosis, endoscopy or surgical exploration of the joint would have been required. In retrospect, it is possible the diagnosis could have been more of a bursitis of the pes anserinus region but this is also difficult to definitively discern. Acupuncture Treatments: Weekly acupuncture treatments were started for the first 5 weeks then decreased to every 2 weeks for 3 treatments and currently she has been coming monthly for the past 3 treatments. Peanut is a nervous dog in the clinic so all treatments were done standing while being fed a few treats. For the first 8 treatments, the same 7 points on each leg were used. They were BL40, BL60/KI 3, GB34, SP9, LR 8, LR3 and ST36. These points focused on decreasing local stifle inflammation and pain as well as downregulating the sympathetic nervous system. The goal was to increase blood flow to the stifles to help with edema and overall tissue health and also to neuromodulate the tibial and fibular nerves in this region. The addition of BL 40 was an attempt to improve proprioception of the hind limbs and therefore help to stabilize the stifles. 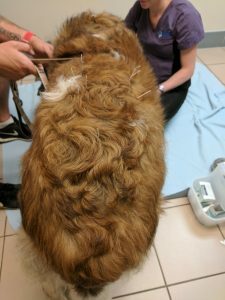 Other acupuncture points were not added until the 9th treatment partly due to the dog’s tolerance and partly due to my inexperience. At the 9th treatment, Peanut was more relaxed and myofascial exam showed trigger points and soreness in her lumbar spine. Needles were inserted into BL22, BL23, and BL25 points bilaterally. GV20 was added as an anti-anxiety point. SP 10 and ST 34 were also added bilaterally to help with local stifle pain and inflammation. This same treatment was repeated at the 10th treatment. Only dry needling with coated Seirin 0.2mm x 30mm needles was performed initially. Each treatment lasted 10-20 minutes depending on her tolerance level. Massage of the thoracolumbar spine was performed while the needles were in place. Laser would have been a great option for Peanut but is currently not available at our clinic. At the most recent visit, shorter coated Seirin needles, 0.2mm x 15mm, were used on peripheral leg points (ST 36, SP 9, SP 10, GB 34, ST 34) and they stayed in much longer. Hwato uncoated 0.22mm x 30mm needles were used in points BL 19-23 and BL25. GV 14 was added for autonomic nervous system neuromodulation. BL 60/KI 3 and BL 40 were also used again with longer Seirin 0.2mm x 30mm needles. In addition to acupuncture, a set of home exercises was discussed with the owner at the third visit. This included passive range of motion and strengthening exercises (see attached sheet). A custom measured stifle brace was ordered and fitted on the 5th visit (via Canadian Animal Rehab services http://www.animalrehab.on.ca). 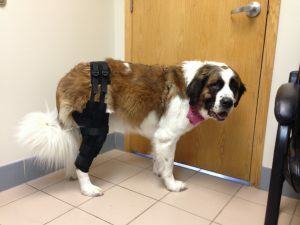 Since Peanut is such a large breed dog, we felt that the stifle brace would help support her good leg and add stability to her injured leg especially when we were ready to increase the length of her exercise time (see picture).